Part of Honeywell's family of self-contained wireless controls, Honeywell's Lynx Touch 7000 control panel features a bright, 7" full-color touchscreen with graphic icons and intuitive prompts for easy operation. It features on screen video, garage door notification and control, tornado alerts for U.S. and Canadian residents, Z-Wave automation capabilities and advanced alarm communications. With it's uncompromising technology, reliability and self-contained architecture, Honeywell's Lynx Touch L7000 is an easy-to-install security system. 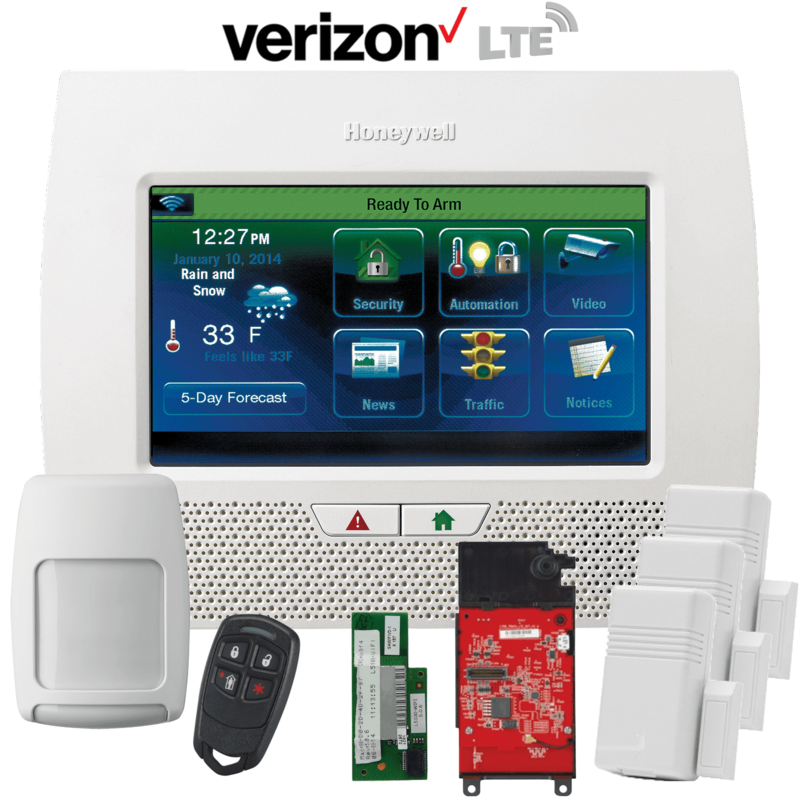 This Honeywell Lynx Touch L7000 wireless security system kit includes; (1) wireless control panel L7000, (3) wireless door/window contacts 5816WMWH, (1) wireless pet-immune motion detector 5800PIR-RES, (1) remote 4-button keyfob 5834-4, (1) Wifi alarm communicator L5100-WIFI and (1) cellular LTE alarm communicator LTE-L57A. With dual-path communications, the Honeywell wifi module L5100-WIFI serves as the primary communication path, and if down, the wireless cellular module LTE-L57V provides the backup Verizon LTE communication path for your Honeywell Lynx Touch control panel to send data to the AlarmClub central monitoring station. Additionally, there is a Z-Wave® module L5100-ZWAVE which can be added, that lets DIYer's integrate security and home automation control in one platform. With Honeywell Total Connect™ Remote Services, end users can control remotely security, lighting, locks, water valves, thermostats, and receive timely alerts to most smartphones, tablets and computers. *Requires the 5877GDPK Garage Door Kit, consisting of the 5877 relay receiver and Z-Wave strobe/sounder. Not compatible with certain garage doors and garage door openers. Garage door control must have working entrapment protection. See installation instructions for details.